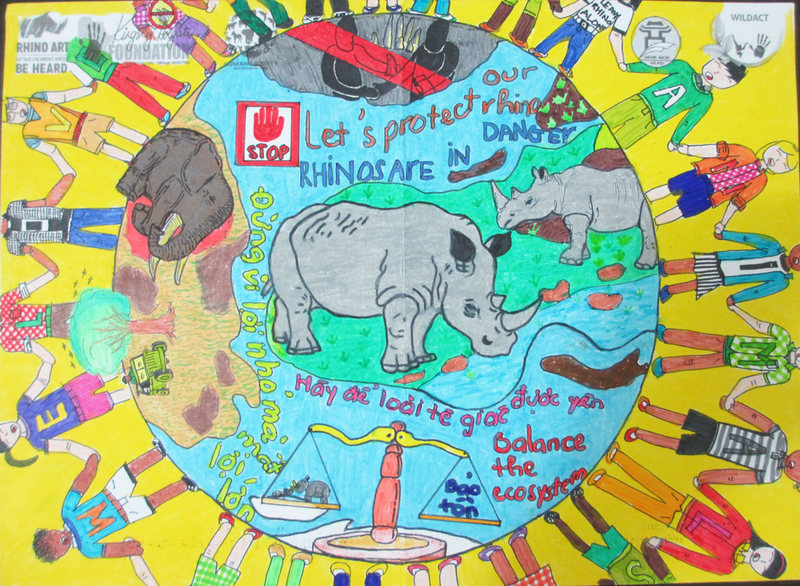 HA NOI, Viet Nam, September 10, 2014 – Six students received the top prize in the first Rhino Art Vietnam children’s art competition aimed to raise awareness about rhino conservation and to reduce rhino horn consumption. Rhino Art Vietnam was organized by WildAct Vietnam, Humane Society International, the Hanoi Education and Training Department and was co-sponsored by the Kingsley Holgate Foundation and Helping Rhinos UK. Let meet the Vietnamese Youth Rhino Ambassadors, who will attend the first World Youth Rhino Summit in South Africa this year! I’m really interested in art and literature field such as photography, fashion design, painting and books. This is why I joined this contest as soon as I read about it on the newspaper. Although at that time, my drawing wasn’t so good and I still had to consult animals painting in books. On top of all this, I really want my ideas, which I put in the painting, can affect people and make them aware of the fact that rhinos are becoming extinct. Besides, I really like travelling in the wild such as camping and climbing. At the moment, I am a scout in Xuant Hoa scout family. Quite a while ago, I was very passive, but after I met Miss Khanh Duong (a teacher from Truong Chinh secondary school) and participated in various summer camps and charity activities that she organized, I found that nature is so marvelous – it softens our souls so our hearts can speak. She is the one who brought me to this contest, so I adore and love her very much. I love animals and despite those Vietnamese that eat cat/dog meat. To be honest, being a small individual, I haven’t done much thing to help prevent that. That’s why after this trip, I hope I will be known and become more mature so that my thoughts and my voices can be heard more widely. For me, the saddest thing is there are only few Vietnamese people acknowledge about the coming extinction of rhinos and that Vietnam and China are the main markets for rhino horns consumption. I strongly believe that children are the hope for our future and that is the reason why we must propagate knowledge about rhinos in schools and newspaper for teenagers. My biggest aim for now is to improve my writing and speaking skills so I can propagate knowledge in an understandable way and convince the young community to join in animal conservative activities. After this trip, I guarantee that I will put into effect, efforts to actively change Vietnamese’s thoughts and behaviors, starting with my own community. It’s time for us to show the world that Vietnam is a friend of rhinos too! My name is Nam. I am 16 years old and live in Buon Ma Thuot City, a nice city in highland, Vietnam. Currently, I’m a student of Nguyen Du High School for Gifted Students. This is what make me so proud since it’s the dream school of almost every secondary students in my province. Nguyen Du high school indeed offers a great learning environment with not only well-qualified & experienced teaching staffs, but also a highly competitive atmosphere in which the students can grow, excel, be challenged & motivated every day. To add to this, speaking of the facilities and infrastructure, we are now moving to a new and much larger modernized place. I am really impressed of our new library and I do look forward to studying here in the new semester. My favorite hobbies are hanging out with my classmate afterschool, going to bookshops, and especially, drawing when I am alone. Whenever an idea come to my mind, I usually try my best to illustrate it on the paper. To be honest, my obsession with art just grows overtime and I cannot imagine not being able to devote most of my time for creative activities. Drawing gives me the true freedom to instantly express myself, my thoughts, my ideas and I enjoy every minute of it. Furthermore, I am very concerned about animals and nature. I hope that through my paintings, I can raise people’s awareness in conserving wildlife and protecting animals, especially the rhinos against poaching and illegal trafficking. Starting with my voice, and then yours, we can change our hometowns, our countries and then finally, we can change our world to be a much better place for all living creatures! My name is Tram. I'm 14 years old. My family has 4 people: my mom, my dad, my younger brother and me. I am a secondary student in Marie Curie secondary school, class 9I. My favorite subjects are English and Literature. At home, my most-liked food are bread, coffee and chocolate. In my free time, I am keen on listening to music and watching television. Plus, I also adore Kpop music. My favorite Kpop bands are BIGBANG, B.A.P, B1A4 and Winner. On television, I like watching comedy and movies on Starworld and Starmovie channel, and sometimes on Disney Channel too. On the holiday, I usually go shopping with my mom. As I know, nowadays, rhinos are being hunted and killed by human just to satisfy their demand. In Vietnam, a large number of people think rhinos' horns are some magical medicines that can protect them against diseases or cancer. But I understand that rhino horns are supposed to protect rhinos from other animals and in fact, their horns are no different than finger nails which are useless for human. I believe that rhinos have done nothing to be pushed to the edge of extinction and I wonder why so many people don't get it, why they can't understand that they have no reason to kill rhinos. We children now want to help rhinos because we acknowledge the fact that rhinos are harmless creatures and they should be protected. Even children can understand it, why adults can’t?! My name is Nhung. I am 13 years old. I am a student at Marie Curie Hanoi School, class 8E2. “E” stands for English. It means our class is more focusing on English and that is also my favorite subject as it helps me to connect with more friends over the world. “2” means our team is not the best ones yet and we always need to try our best to become Number 1. I know about the Rhino Art Vietnam Competition during the time I participated in Co Xinh Art Center in Hanoi. There are only three members in my family: my father, my mother and me. Even though I don’t have any siblings, I was brought up in a small but happy home and we are together most of the time and in most activities. Speaking of hobby, I have a great interest in music. In my free time, I usually listen to some pieces of music, learn to play a new guitar track that I find out on the internet. At the moment, since I am going to reach to the last year of secondary school, I am very busy so I would have to drop out of my guitar class for a while. I may stop my guitar class but not basket ball. I love this sport with great team spirit. Right after this trip, we will have a big match and we hope that we can win. We will win!!! I really like to have a dog but there is no space in my apartment for dog (as I know dog needs a lot of space, like a garden to run and play) so I have to wait until I am grown up and have my own house (hopefully it would be big enough). Though living in busy city, I am also interested in wild animals. We learnt that they are parts of the ecosystem and they keep the balance for our earth. As a result, I believe that they deserve to have their own life in their preferable environment. At the moment, not everyone understands that simple thing. Nowadays, people hunt wild animal for their skins, their bones or horn…, or just to enjoy themselves as it is a hobby or to show off their power or wealth. Then eventually, wild animals are disappearing day by day over the world and the rhinos are one of them. Rhinos are being hunted for their horns because of a mistaken belief that considers rhino horns a medicine that can cure lots of illnesses. But they don’t know the truth is that the rhino’s horns are just like our nails and our hair which has no medical value at all. In Vietnam we lost the last rhino at year 2010 and now the children here can see the rhinos on TV only. That is the big lost for us, young people. And We, Young People need to do something immediately for Wild animals, for Rhinos and for our self. 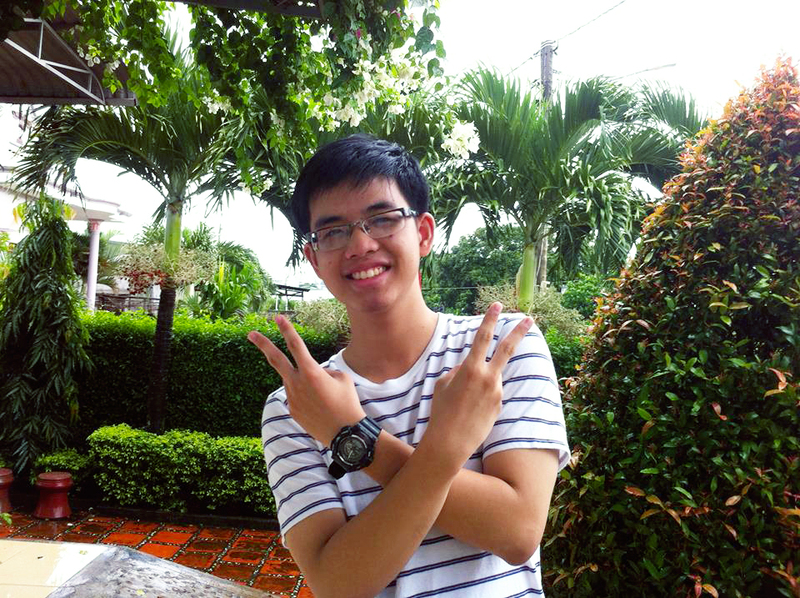 Hung was born in March 7th 1997 in Hanoi. Back then he was just an ordinary boy like any other kids at his age. However, when he was studying in secondary school, he started to find out his passion for English and other scientific subjects such as Math, Physics, Biology or so. In the last year of his secondary school, he decided to take an entrance exam into Hanoi-Amsterdam high school, which is said to be everyone’s dream. Miraculous as it was, he got into English specialized class. Despite the fact that English is an Art subject that falls into group of subjects referred to as social sciences, he never gave up on his dream of becoming a person that can contribute something worthy to biological sciences. During his second year of high school, Hung won the 2nd prize in the Vietnam Science and Engineering fair in Biotechnology field, proving that the flame of passion and youth inside him never ends. Recently, Hung showed his deep concern about wild animals in Vietnam, especially rhinos, which are on the verge of extinction. He acknowledges that if a single species goes extinct, it will have such bad influences on the biodiversity, leading to such deadly and unforeseen consequences. However, many people fail to realize the importance of this issue; therefore he has decided to join a contest called ‘Rhino Art Vietnam” in order to raise awareness of young citizens about those poor creatures and let them realize that extinction means gone forever! 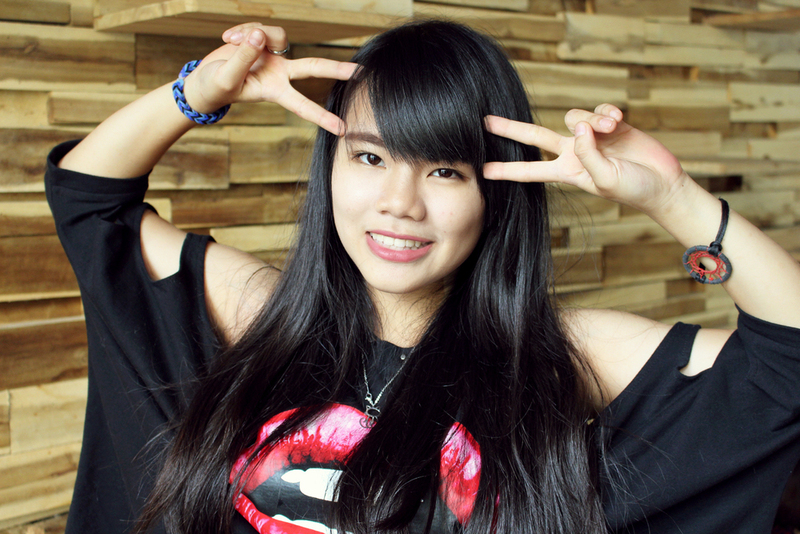 Nam was born on 15th May, 2001 in Hanoi. He is the eldest son of his parents. Nam and his younger sister have attended Cung thieu nhi Hanoi (Hanoi Art school) since a very young age (around age 5) so they both knew drawing and coloring before they knew how to read and write. Ever since then they usually showed a passionate interest in art. One of the very first artwork of Nam Tuan is the portrait of his grandmother and this painting has been retained and stored carefully. Nam loves and usually coddles his sister: Minh Thao, who is now in grade 5. At home, Nam serves as role model to his younger sister and often helps her in studies and other activities in daily living. Nam’s dad is a construction engineer and his mother is an accountant. Both of them are very busy and do not have much time for him. Consequently, Nam Tuan’s parents always want him to be an independent person. Since grade 6th, he has gone to school by himself by taking the bus. Further, apart from paintings, he also has real passion for history, mathematics and English. He spend most of his time learning at home by himself and his overall average score in grade 7th reached 9.0 out of 10.0. During his free time, Nam usually spent hours drawings and sketching ideas that popped into his head and many of his artworks have been published. 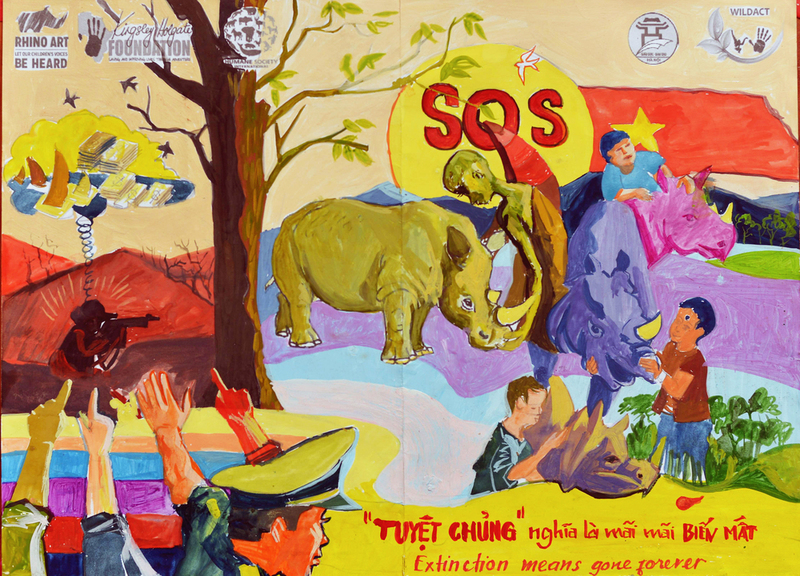 By joining the Rhino Art Vietnam contest, he hope that his painting can inspire young people in the world to stand together and work together to protect the rhinos which are in danger! These Vietnamese delegates will join another 100 young conservation leaders from 20 other countries in the world at the symbolic iMfolozi Game Reserve to directly address the current rhino poaching crisis and develop resolutions needed to stop burgeoning wildlife crime.